When a sale falls apart early on, it's disappointing. But when a sale falls apart at the very end of the sales process, just when you thought you were about to close, it's well beyond disappointing. At this point, you've invested a lot of time and energy into the sale, and you may well be counting on it to meet your quota. However, there's no need to despair (yet). Sometimes if you can figure out what happened, you can make a last-minute save. If not, you can at least remember what went wrong so that the next time you can catch the problem early on in the sales process, when it's easier to resolve. Here are some of the most common circumstances that can cause a sale to fall apart. You're Addressing the Wrong Need: Prospect needs are not one size fits all. It's true that prospects in related circumstances will often have similar needs, but you can't just assume that a specific prospect will have a certain need or that that particular need is what he is most worried about. Don't make assumptions – each time you meet a new prospect, ask questions to uncover his critical need and then build your sales presentation around meeting it. You Didn't Prove That You Have the Solution: Addressing the right need isn't enough; you also have to show the prospect that your product will fix his problem. And just saying "our product will fix that" isn't enough for the prospect unless you already have a very strong relationship with him. Not surprisingly, prospects are reluctant to trust salespeople, especially salespeople who are total strangers to them. So if you're going to make a claim, you'd better back it up with hard evidence. Testimonials or endorsements from people that the prospect trusts are a powerful way to prove your point, but there are plenty of other options as well. The Prospect Isn't All That Worried: Most people won't make a purchase unless they think they really need it. The more expensive the product, the greater that urgency needs to be before they'll commit to a purchase. So even if you address the correct need and convince the prospect that you have the solution, he won't take the next step unless he also believes that the problem needs to be fixed immediately. There are two basic approaches you can use to create prospect urgency: you can show him that his problem is more critical than he realized, or you can show him that the solution you're offering is only available for a limited time – for example, the product model is about to be discontinued. You Didn't Prove Value: A prospect isn't going to buy something that he feels is overpriced, even if all the other buying criteria are met. Instead, he'll probably turn to your competitors in the hopes of getting a better deal. Proving value doesn't mean offering a price break; it means showing the prospect why the product is worth the price you're asking. Usually, this entails pointing out the product's benefits and equating them to how they will either make the prospect money or cut his costs. The Person You're Speaking With Isn't a Prospect: If you rush into the sales process without taking the time to qualify the prospect, you can end up wasting a lot of time with someone who is literally incapable of buying from you. 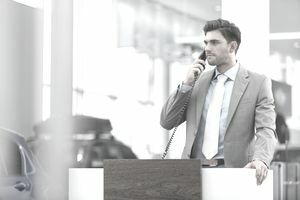 If you've erred by pitching to someone who is not the actual decision-maker, you may be able to retrieve the sale by getting the person you've been speaking with to connect you with the actual decision-maker. However, the odds of success are slim if you've gone through an entire sales process already. Of course, if it turns out that you're dealing with someone who simply cannot buy from you or has no need to buy, you never had a chance to close that sale. The best you can hope for is to save that person's name in case he becomes a prospect in the future and pay more attention to qualifying future prospects.